We believe that a company’s human resource is its greatest asset – the most valuable one. The quality of our people determines our corporate success. We hire and retain the best and invest in the development of our human resources. Like every employer, Machica Group believes that if employees are satisfied, they are more likely to satisfy clients. And for an employee to achieve personal satisfaction, his employer’s support is vital. In this period of rapid globalization where people are always on the move, everybody would want to be a part of a challenging and dynamic working environment. Choosing the right company to get the career you want is a very crucial step. It can impact on how far you go and how much you achieve as you strive for success. 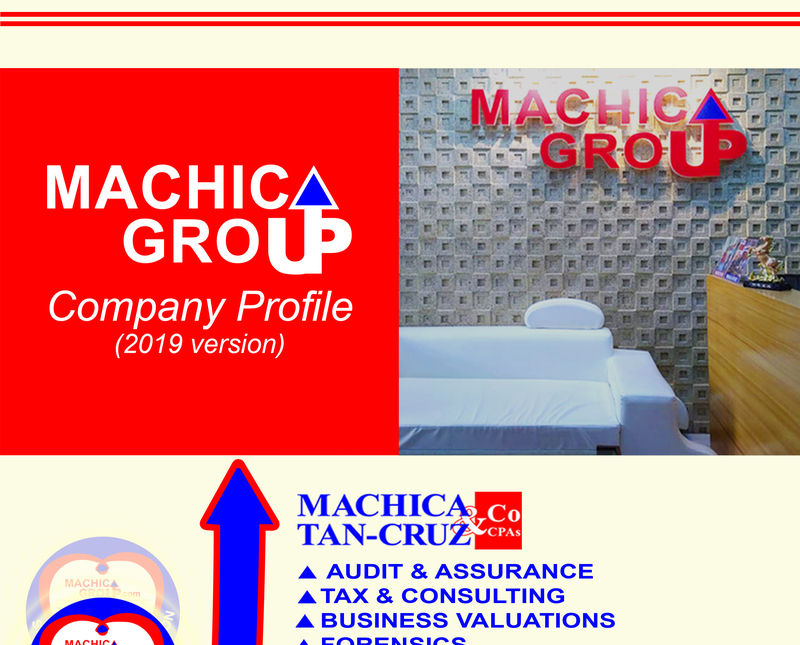 Here at Machica Group, we can help you build the right foundation that is needed for you to be globally competitive. 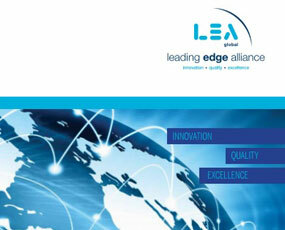 In fact, our alumni are now at the helm of their corporate careers in the local or overseas companies. Whether you are an accomplished professional or a promising new talent, you will be challenged by the work, the people on your team, and the clients you will serve. You will be constantly learning and your ideas will be welcomed in an atmosphere of collaboration and teamwork. And speaking of teamwork, it is no less but our core value. We invite you to discover exciting possibilities that can be yours when you join us. With us, your career is all about challenging and breaking your limits. We seek young and dynamic people who are always looking for an extra room for growth and are constantly challenging themselves to shine amid dynamic business landscape. Our clients look to us for fresh and innovative ideas, information, and solutions from brilliant people like you to help them improve the way they do business. 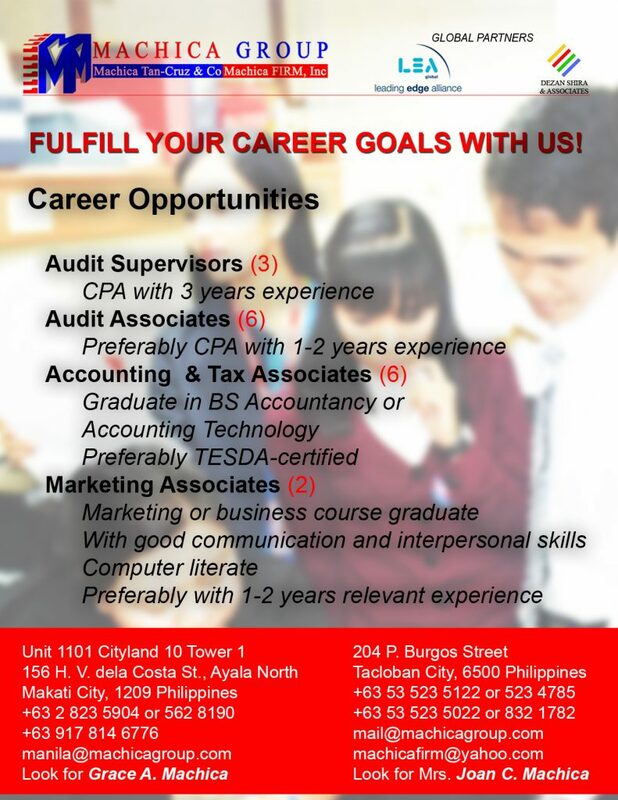 So if you wish to develop your talents to the fullest and to build a fulfilling career, come and join us. And since we are always on the look-out for brilliant minds, you might want to check into these current job opportunities. The Executive Assistant schedules and arranges meetings and appointments of the Chairman and the other key executives. She also serves as the Group’s Communication officer linking the Group with its external stakeholders. A graduate of Mass Communication or other related course. The sales and service officer is responsible for identifying opportunities, cultivating, generating and maintaining profitable relationship with customers and contributing to the sustained growth of the Company. He shall also serve as a liaison officer to the different government offices and private companies. The manager’s main responsibility is to manage the accounting, tax, audit and assurance engagements on assigned clients. Furthermore, the Manager will assist the Group Head and the Chairman in discharging the service deliverables and engagement contracts with its clients. He/she shall also act as the administrative head of all subordinates belonging to his division. It is the team leader’s responsibility to assign, direct and supervise staff members on the basis of his knowledge and capabilities. He/she has to support the training of staff members, offer guidance and direction and to provide constructive criticisms of working papers and other staff output. It is also the team leader’s responsibility to conduct regular evaluation of staff members and to discuss to them the evaluation results. Aside from being a team leader, he/she has engagement deliverables and client servicing responsibilities. 6. If previously employed, certificate of previous employment and/or employment clearance is needed.